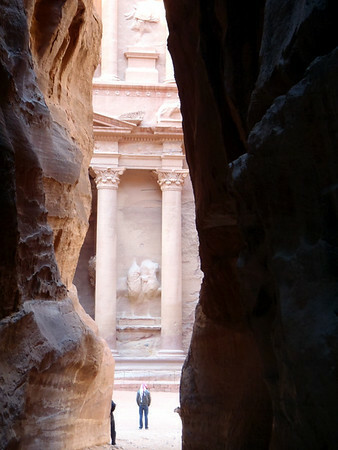 After paying the entrance fee, wincing at the US$85 cost of a 2-day pass, there’s a short walk to the Siq, a 1.2 km slot canyon that leads to Petra proper. 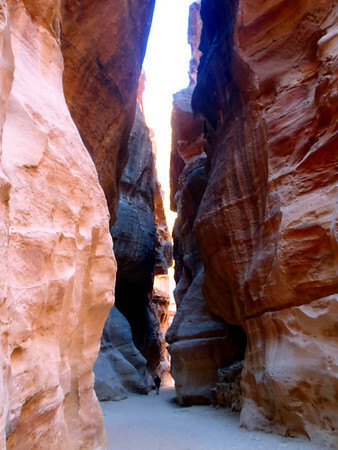 Deeper in the siq, there are channels carved into the walls for capturing and redirecting rain runoff from the rocks. Eventually, something interesting appears through the bends in the canyon. 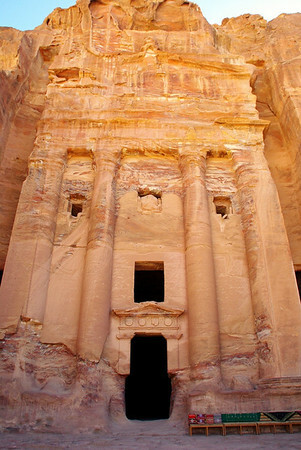 Despite its name, the original purpose of the structure remains unknown. 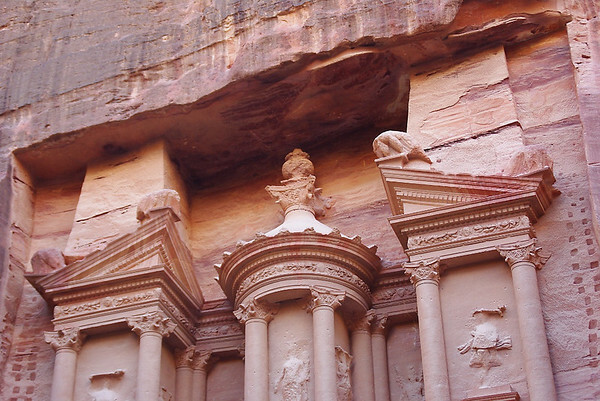 According to local legend, pirates hid their treasure in the sandstone urn near the top of the facade, which has been pockmarked by bullets. Further along are the Royal Tombs, ca. 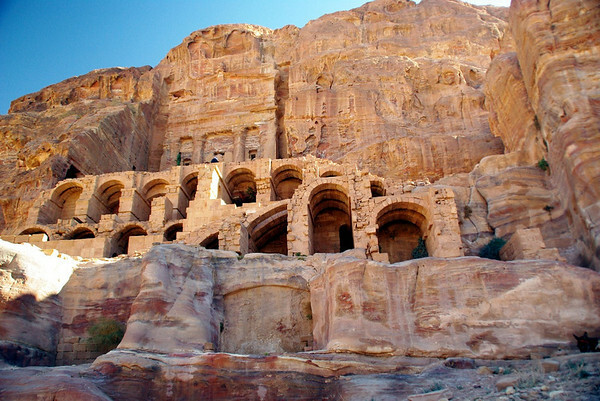 70AD. 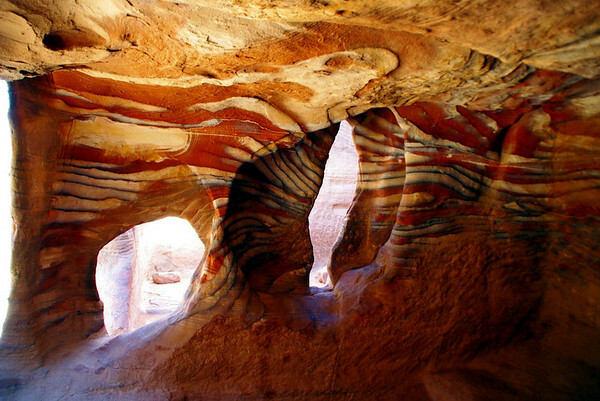 Inside, the mineral-leaden sandstone has weathered to show beautiful colors. 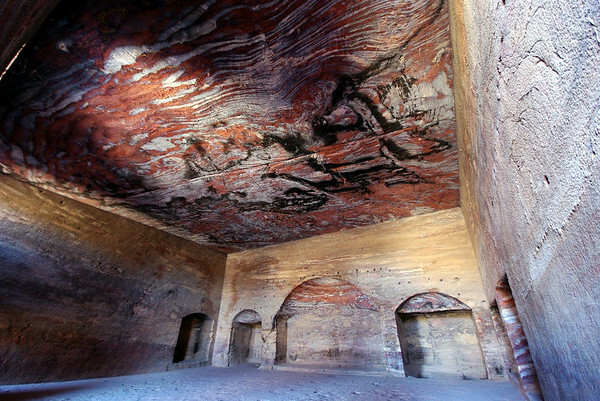 The interior of the Urn tomb is unadorned, decorated only by the colorful sandstone. The theater (ca. 1st century AD), with seating for 6,000+ spectators. 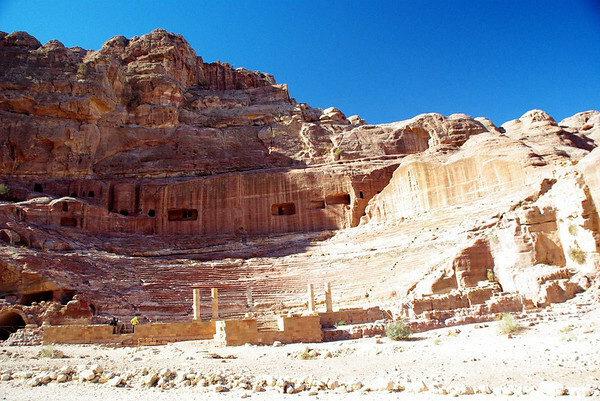 Above the uppermost row of seats are the remains of tombs that were destroyed when Romans expanded seating capacity. A curious camel makes a move for my banana snack! 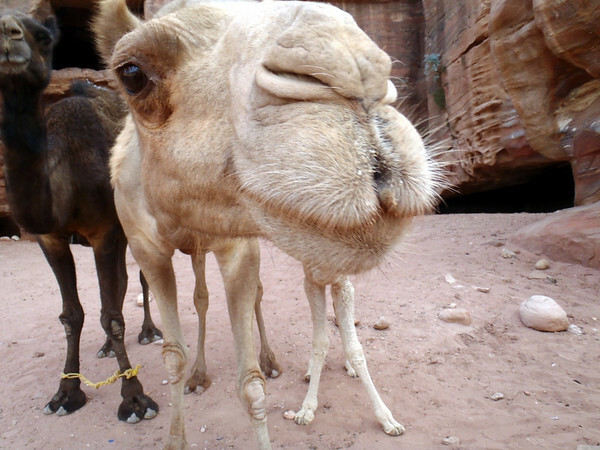 I was too busy dodging mama camel to get a photo of the cute baby. 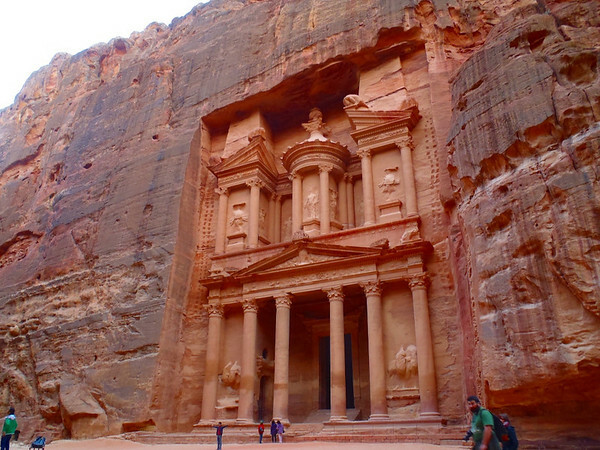 Petra was amazing, and the two days were well spent seeing the usual tourist bits, and also hiking up steep trails to enjoy the sweeping views of the surrounding countryside. And I still didn’t see everything! 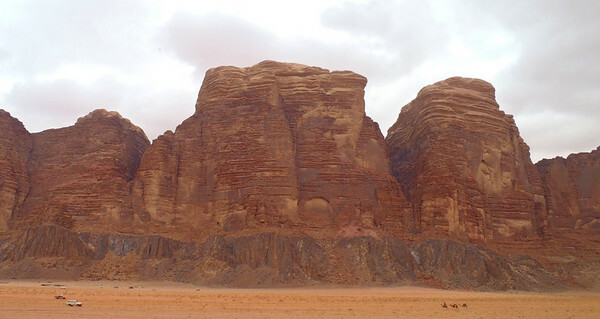 Further south I wanted to visit Wadi Rum, home of Bedouins and former stomping grounds of Lawrence of Arabia. I found camping at the village of Rum in a large sandy lot surrounded by brown sandstone cliffs, and with a few restaurant and markets close by decided to call it home for a few days. 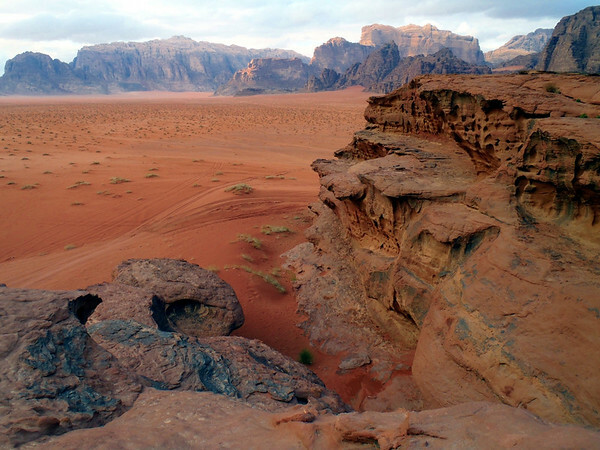 Typical view of Wadi Rum. 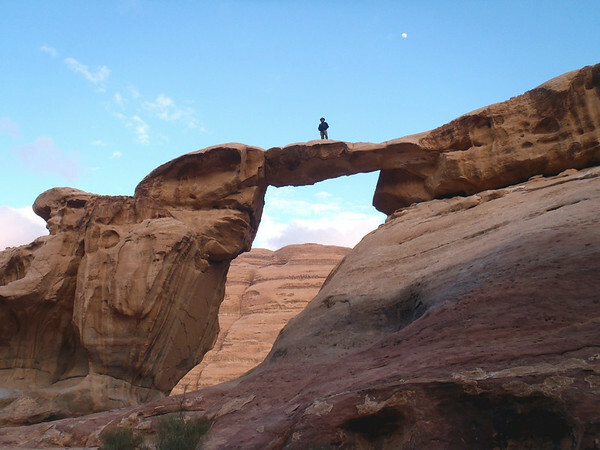 Sandstone, camels and 4×4 trucks. 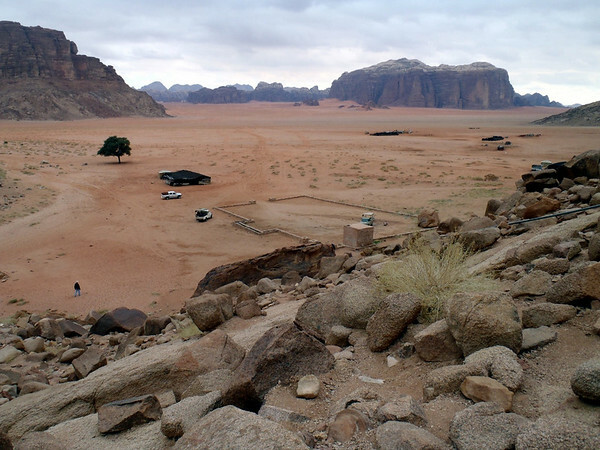 Before I could complete setting up camp, I was approached by several Bedouin offering jeep tours into the desert, from young teenagers with new Landcruisers to soft-spoken older fellas with beater pickup trucks. Riding a motorcycle in sand is not my forte (by a long, long shot), so I signed up for a 3 hour tour with one of the guides with a beater puck-up. The first stop was at Lawrence’s Spring, where I scrambled over the boulders and up the slope to take in the view. Further along, we stopped at the natural bridge at Um Fruth. We stopped for tea at a Bedouin tent, reclining on dark, colorful rugs and warming our hands near the coals of a low fire. Next stop was Khazali canyon, a deep, narrow fissure containing rock inscriptions and small pools of stagnant water. 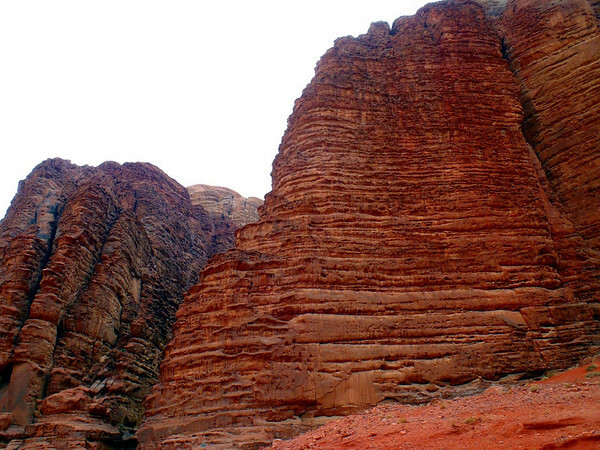 Entrance to Khazali canyon (which has bisected Jebel Khazali). Standing water prevented me from going very far into the defile, but I got far enough to see the inscriptions. 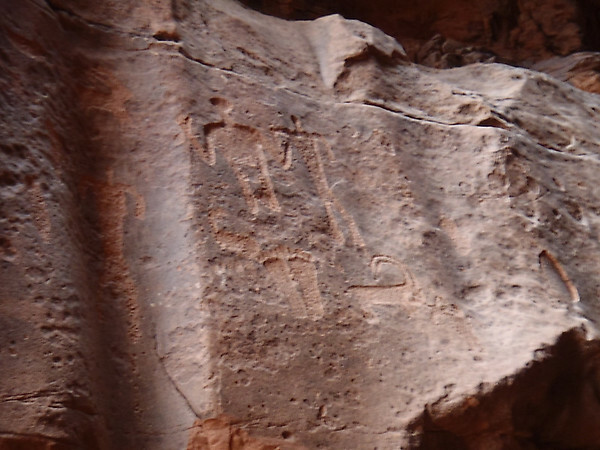 Nabataean carvings in Khazali canyon. A stop at the sand dunes wouldn’t be complete without getting temporarily stuck. 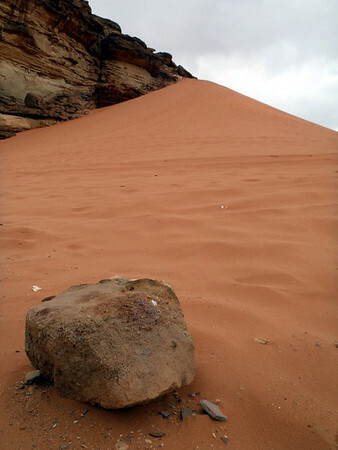 Sand dunes at Wadi Um Ishrin, about 100 meters high. It was an excellent tour, and leaving the driving to a professional allowed me plenty of time for photos and gaping at the landscape. Back at camp I met two rock climbers, Lasse from Denmark and Chris from England. While they spent the day climbing I tinkered with the moto: adjusting the valve lash, checking electrical connections and the tightness of fasteners, setting the spark plugs gap, and generally looking it over. Fortunately, I had help from a feline visitor. Bike maintenance with help from Accident Cat. This fellow showed up at camp one day in quite a sad state: Dragging a broken, lifeless leg back leg, a bent tail, an oozing jaw infection and one bulging blue eye the color of bright sapphire. The climbers christened him Accident Cat, and by all appearances he was not long for this world. But every day the cat would appear like an apparition, plowing a crooked groove in the sand where paw prints should have been, meowing for food and attention. I would feed him a can of tuna each day, then fill the empty can with fresh water, and after supping he would nap in the shade of a nearby shrub, only to reappear at dusk for a social visit. Worst was the bulging, bright blue opaque eye, which seemed on the verge of popping out at any moment. But he kept on keeping on, and last I saw him he was pestering the latest campground arrivals, garnering shock, sympathy and food. Long live Accident Cat! 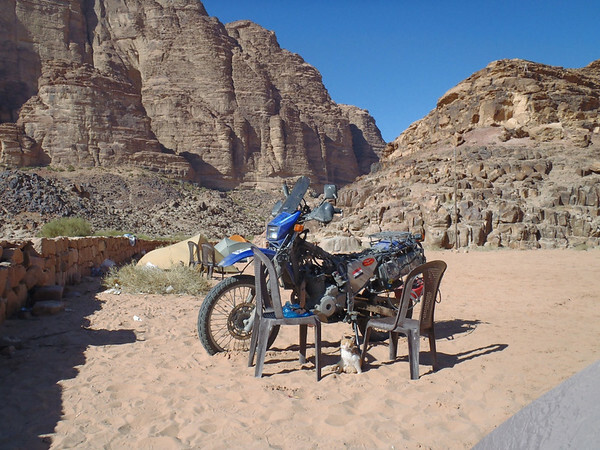 Next stop was Aqaba, where I would catch the ferry bound for Nuweiba on the Egyptian Sinai. #1 | Written by Doug S. about 8 years ago. 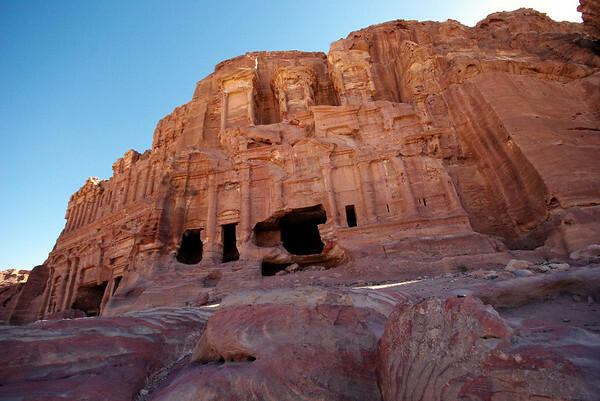 Sean: Those are the most awesome Petra pix I’ve ever seen ! I’m insanely jealous, and glad ya spent at least two days there.